Stainless Steel Hardware, and Cables for longevity. Guide Post and Bunk Boards included. No hidden costs. (Lift shipped complete). 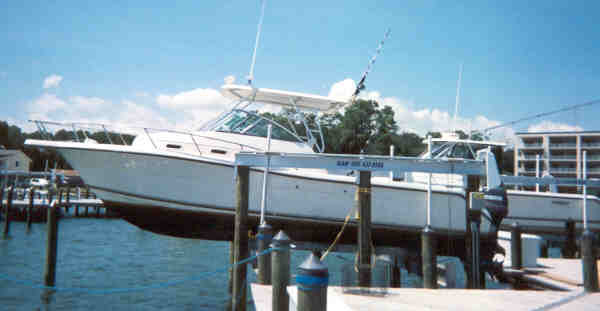 In meeting the challenge to be the leader in the boat lift industry, we have built the ultimate aluminum cradle lift. It has greater strength, more convience, and is very aesthetic. Lighted ground faults standard on all lifts. Adjustable zincs to protect against electrolysis. Aqua Marine Gear Units provides proven dependable lifting power. Twin independently spring loaded switches are standard. All cradle lifts come with grease fittings for easy maintenance on bearings, axle bolts, drive blocks, and pulleys. Drive shafts open to permit easy access to cables and bearings, for maintenance and routine inspection. Pre assembly and testing reduces installation time and on the job problems (If any) Saving Time and Money.